Specially designed for Halloween parties candy bucket, kids would like it. Two kinds of candy kettles optional. Kids can choose the one they like. 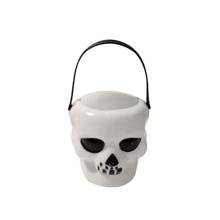 Special candy kettle design for Halloween. Great way to hold and keep your treats in one place. A good addition for the Halloween party decoration. Create a horrible and exciting atmosphere to give you a fantastic themed party. Perfect for Halloween, Carnival, Masquerade party etc.